Kudos and confetti to Jordan Barab at Confined Space who marked one year of fine blogging yesterday. He is a dedicated and tireless voice for the safety of the worker and we learn something new and important (albeit disturbing) every time we visit his site. Thanks for your efforts, Jordan — it’s excellent and important work that you do — one could only hope that we would all see the day when you would have less sad news to report. A warm note of appreciation is also in store for Anita Campbell at Small Business Trends. Yesterday, we enjoyed the unexpected distinction of having Workers Comp Insider featured in her PowerBlog Review. Very kind of you to say such nice things, Anita — it’s a mutual admiration society. Visit the sidebar at Small Business Trends to read about other business blogs that have been featured in this series – it’s a good way to explore how businesses are using weblogs. 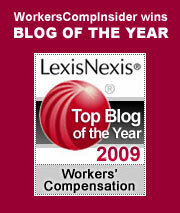 We’ve added a few new blogs and resources to our sidebar that visitors might want to note…Benefitsblog features tax, benefits, and ERISA law commentary and news; the HealthLawBlog tracks state and local news and matters in health law; and rawblogXport focuses on job safety, union news, and worker rights — they are all worth a visit. A few more sidebar additions: check out Occupational Hazards, a news headline aggregator on issues related to workplace health & safety; and if you just can’t get enough blogs, The Blog Herald highlights news from the blog world. Letting employees speak directly to customers requires a huge amount of trust. A loose cannon might reveal corporate secrets, give out the wrong message, or even open up the company to legal trouble. If the fear is giving the keyboard over to the rank and file employee, why aren’t more CEOs keeping weblogs? Perhaps many companies may well be having trouble finding their web voice, which requires a greater level of transparency and authenticity than most other media…corporate communications are generally carefully crafted and packaged by PR and advertising people. For some businesses, a filtered voice is their only public “voice” to the world at large. It is precisely this tendency to view marketing from such a narrow channel that leads to another unsettling corporate approach to weblogging. As the article in Fast Company points out, many a business foray into the blog world is a ham-fisted or blatant attempt to exploit the medium for a marketing end. Companies that view blogs as “ads” or that see the blog network as merely a channel in which they can foist or insinuate press releases will be doomed to failure. But there should definitely be a place for serious business blogging as a public communications tool. Every business is – or should be – a topic expert on whatever it is they manufacture, deliver, sell, or service. Anyone who has an interest in the particular product, service, or industry at hand would likely find informed comment and trend monitoring of great value. Some businesses are doing this well. Anita Campbell and David Patterson at Small Business Trends are a case in point. And even in a niche as narrow and esoteric as workers comp insurance, we are encouraged to see the nascent network of interested parties that is emerging. Hopefully, we will stay tuned for more. Oh, and did we mention that Fast Company has a weblog too? Roberto Ceniceros of Business Insurance reports that the New Jersey Supreme Court recently awarded workers compensation benefits to an employee injured in a go-cart accident that occurred after hours. This finding reversed an earlier decision that dismissed the case as extracurricular horseplay. There are a lot of gray areas when it comes to compensability and recreational activities are among them. Generally, recreational activities would not be compensable. The foundation for determining compensability is “arising out of and in the course of employment. On first blush, an activity like riding a go-cart after work doesn’t sound as though it meets that standard. But there are certain circumstances when a court may decide that an injury resulting from a recreational activity would indeed be compensable. When an employer requires participation in a recreational activity, for example; or if it can be shown that the employer was deriving significant benefit from the employee’s activity at the point of injury. Sometimes, when the injury occurs on the employer’s premises — even if it stems from an activity that is recreational and voluntary in nature — it may be deemed compensable. There are no black and whites. Laws vary stated by state, as do court interpretations. Employers should be cautious in the types of recreational activities they mandate, whether the coercion is implied or overt. Sometimes a company’s cultural values can be so strong as to make participation in teams or activities seem anything but voluntary. Most of us have seen companies where the pressure to join an after-hours sports team or some other activity can be quite intense. That could mean trouble in the event of an injury, particularly if that pressure came from a manager or supervisor. Adjuster.com brings us the story of California’s $7 billion workers compensation miscalculation. Jottings By an Employer’s Lawyer points to an upcoming debate over domestic violence legislation that would have FMLA type implications for employers. Jordan Barab’s Confined Space has many worthwhile items, as usual. Today, he has an item about the Mexican government’s reaction to the AP story about the workplace death toll of Mexican workers, a follow-up to an item that he covered earlier in the week. Utah – David Fletcher’s Government & Technology Weblog is a weblog that describes itself as “news and perspectives from a long-time egov advocate.” Among other things, David tracks how technology is making the government in the state of Utah more accessible to the people, and how technology is being used by governmental sites in general. Pennsylvania – PAWC is a weblog by Judge Robert Vonada, a workers’ compensation Judge in the Altoona Field Office of the Bureau of Workers’ Compensation Office of Adjudication. He blogs development’s in the state’s workers’ comp practice and procedures. Human Resource Executive’s Workindex reports that the ranks of uninsured workers at large firms – companies with 500+ workers – have been growing at a rapid rate. According to a recent report – The Growing Share of Uninsured Workers Employed by Large Firms – issued by the Commonwealth Fund, the proportion of uninsured workers at large firms increased from 25 percent to 32 percent in recent years, while the proportion of uninsured workers in small and mid-sized firms declined. Meanwhile, as the ranks of the uninsured swell, Maine is experimenting with universal access to affordable healthcare in a program called Dirigo. “The goal is to insure 31,000 people this summer and cover the state’s remaining 130,000 uninsured by 2009.” It’s a laudable effort that bears watching, although other state initiatives such as “pay or play” programs have met with limited success. The healthcare situation is likely to get worse before it gets better. Recent reports indicate that healthcare costs continue to grow, but at a slower rate. “In observance of March as Workplace Eye Safety Month, the American Academy of Ophthalmology, the Eye M.D. Association, and Eye M.D.s across the nation want to alert Americans to the possibility of eye injuries in the workplace. The following are resources for employers and employees on regulations, personal protection equipment and eye injury prevention. Marsh offers an interactive tool to let you compare your workers comp losses with others in your industry. It entails entering a few bits of information, and it then generates bar charts that depict industry numbers and your variance from the norm. Of course, it’s a rough benchmark, but it still offers an industry-specific yardstick, and most of us are eager to see how we measure up to our peers. The site has other interactive tools too – test your liability limits, or benchmark your Directors & Officers liability. At Lynch Ryan, we are ardent believers in the need to measure and benchmark losses against the industry and also against a company’s own performance over time, so we are happy to see this handy tool from the folks at Marsh. If you haven’t visited the Marsh site lately, you might find some valuable risk management or HR resources.